The community of Harmony is the ultimate realization of a dream long-held by its founders, Jim and Martha Lentz. The Harmony Institute was founded in 1996 to develop peaceful, healthy, co-existing relationships with domestic animals and natural ecologies. But the dream was to create a complete town. It would be unlike any other master-planned community in Florida, with a vision to build an immersive expression of a more healthful, more fulfilling life experience, lived in closer contact with pets, wildlife and nature. Many locations were considered before deciding on the current property – 11,000 acres of Old Florida in an area historically known as the Triple E Ranch. Today, Harmony Florida is home to approximately 1,250 multi-generational residents and is an ongoing expression of the commitment to and vision of environmentally intelligent living. Harmony’s 12.5-mile network of connected paths not only provide ongoing contact with nature but they also offer safe avenues away from street traffic for invigorating walks, jogs and bike rides. Community-owned boats, athletic courts and fields, a community activities program and an 18-hole championship golf course that’s also a Certified Audubon Cooperative Sanctuary provide a full roster of mentally and physically stimulating things for all ages to enjoy. That immediate “we’re home” feeling you get the moment you enter Harmony’s neighborhoods is in part a result of their neo-traditional design that bring back so much of what was right about America’s small towns. You’ll find broad sidewalks, welcoming front porches, short set-backs from the streets and, with many plans, rear garages with off-street entry. 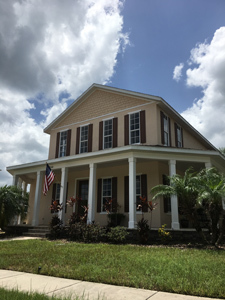 The architecture and landscape are inspired by the native Kissimmee Prairie and Florida flat woods vegetation and the ranches and settlements of Central Florida in an effort to be in balance with its larger, regional setting. Community identity is further enhanced by natural and man-made boundaries and landmarks. Our many seasonal events capture the essence of life in Harmony, with its small town warmth and friendliness, and we are pleased and proud to share these community celebrations with the general public. As with any vibrant town, there are distinctive neighborhoods in Harmony. Our mix of housing styles and sizes creates a healthy and dynamic economic and social balance. Open-space assets such as Buck Lake and Cat Lake as well as the Harmony Golf Preserve are carefully protected treasures, but they are not cut off from the community by private lots on their shores or boundaries. These visual and recreational resources are visible from our streets and available to appreciate. Great opportunity to lease 6,000+/- sqft of office space in the heart of harmony! The subject property was previously used as an information center for the community and features a very nice build-out throughout. The building’s floorplan offers opportunities for many different uses as well and features two kitchen/break rooms. Call today for more information!